The baby stroller is undoubtedly one of the most important investments we make as parents. It will be with us at least for the first three years of our child’s life. Due to its daily use, it requires minimum maintenance so that its benefits are maintained, and its durability lengthened. 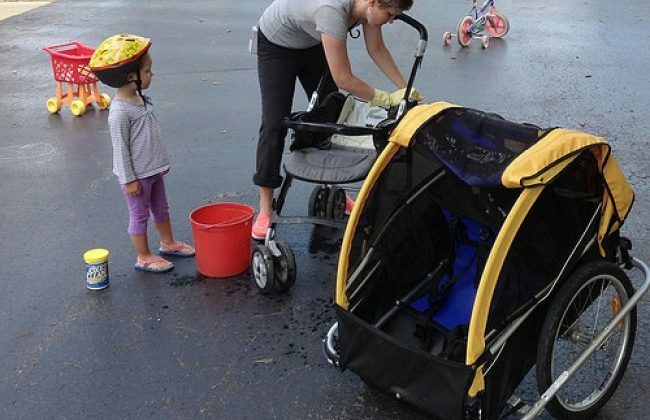 The maintenance of the standard baby stroller is straightforward, and you can do it yourself. For this, we recommend you create and follow a list that will allow you not to forget anything. Those are a little more complicated and you might need to hire a professional from time to time to get the maintenance done. But first here are some tips that will help you with necessary maintenance. The first thing is to disassemble the baby stroller. Remove the wheels, the carrycot, the baby carrier, and separate it from the chassis if possible. In this way we can treat each part individually, we will access each element easily and avoid getting dirty. Once divided into parts, we clean each piece, since cleaning is the central part of all maintenance. Dirt is the source of most of the problems that arise in baby strollers. For this it is best to use a wet cloth and a dry one and go over each part, paying particular attention to the corners where dirt usually accumulates, such as the folds, the contact between the wheels and the chassis or the folding areas. Pay special attention to the joining and bending zones. For this, we can also use a vacuum cleaner and a small brush that allows us to access the most difficult areas. As for cleaning the fabrics, you must follow the manufacturer’s instructions as they may be different in each case. As a general rule, outer fabrics are cleaned with a sponge soaked in hot water (30-40 Cº) with soap or mild detergent. The inner part of the carrycot, made of natural cotton and the protector of the chair, is machine washable at 30 Cº. After cleaning, it is time to lubricate the parts that suffer the most mechanical wear. For this, it is ideal to use a silicone-based spray that will grease, avoiding the subsequent sticking of dust and dirt as happens to those based on oil. The areas to be lubricated are all those that are mobile, such as the axles, the bearings, the wheel supports, the damping, the towing brakes, the anchors of the chair, the carrycot and the baby carrier, or the folding system of the stroller itself.